If you are thinking of switching your conventional combustion engine car, to a plug-in hybrid electric (PHEV) or fully electric car (EV) then you need to take into account how much money on fuel you can save. 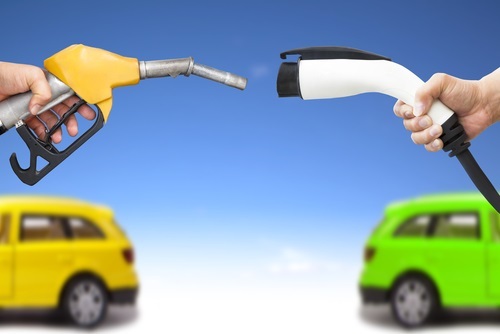 We have taken the top 5 most important fuel vs electric charge comparison factors, and made a comparison calculator tool. 1) Journey distance- The average UK motorists drives around 9,000 miles per year. Company car drivers tend to drive more at around 18,000 miles per year. The amount of miles driven varies between men and women, with women driving an average of 8,000 miles per year and men over 10,000 miles per year. Both men and women with children tend to drive more miles per year at around 1,000 extra. To calculate your annual money saving on fuel from switching to electric, use our table below and enter you estimated annual mileage. You can use the tool to calculate the saving on any journey length; simply enter the length of the journey into the calculator. By default the journey length of 1,000 miles is automatically entered. 2) Miles per Gallon- For new vehicles since 2013, the UK average fuel consumption has increased to around 50 miles per gallon (mpg) for petrol vehicles and around 58 miles per gallon for diesel vehicles. This represents around a 28% increase in fuel efficiency since 2007. As the average age of vehicles in the UK is around 7.44 years, the average MPG for UK cars is lower than the 2013 figures. By default we have entered a MPG of 45, if you know you exact vehicles MPG enter this figure into the calculator. If you don’t know your vehicles fuel consumption use the fuel consumption guide, then enter your cars fuel consumption into the calculator above. 3) Cost of Fuel- The cost of petrol and diesel fuel is expensive, mainly due to the expense of extracting and forming these fuels from crude oils. As well as the expense in finding these natural fuel reserves from explorations, including deep sea drilling. Import duties and taxes also effect fuel prices and are impacted by government policy and legislation. Crude oil is also traded as a commodity and thus the price car vary day to day, in fact the price of fuel will always vary because of these factors. Currently the price of petrol and diesel is not as high as it has been in recent years. However the price is still very expensive in comparison to electricity and thus makes up the majority of the cost of running a petrol or diesel vehicle. The average price in the UK is now around £1.14 for petrol and £1.20 for diesel although this varies between fuel stations. Find the current fuel price below, and enter this into the fuel cost comparison tool. 4) Miles per Charge- Assuming the EV or PHEV is 100% charged, the distance that it will travel on that charge is dependent on a lot of factors. Firstly and most importantly the recommended range of the vehicle from the manufacturer, these can be found in the table below. These figures are usually optimal in good weather conditions, with normal but efficient driving styles. In the real world these range can be anything from 70% to 90% of this, but it will vary on weather conditions especially temperature, driving style, what else in the vehicle is consuming energy ie. heating or air conditioning, the load of the vehicle ie. how many passengers, terrain or road surface and the age of the vehicles fuel cells, as these will very slowly deteriorate over time. Nevertheless taking into account that the average single trip car journey in the UK is only 6 miles and 98% of journeys in the UK are under 50 miles, most of these EV’s will have sufficient range. Use the table below to enter the range of the electric or plug-in hybrid electric car you are looking to buy. 5) Cost of Electricity- Unless you use Solar PV to generate and use your own electricity free of charge, you will be paying for the electricity your EV or PHEV uses to charge the batteries of fuel cells. Usually these are lithium ion fuel cells and their size and capacity varies dependant on what vehicle you are looking at. As a result of the cost to charge the fuel cells will also vary. Find the latest electricity tariff by following this link UK electricity tariff. We have put together a table below and based the vehicle charge cost by taking the battery capacity in kwh and multiplying this by the electricity unit rate at 10p/kwh. It is worth noting that some tariffs allow for cheaper electricity over night when you are likely to charge an EV, also there are lots of free public charging stations. As a starting point our fuel cost calculator by default has £1/charge already populated. Change this by entering the actual cost for the EV or PHEV from the table below. Use the bottom buttons to then calculate how much money it will cost for the elected journey distance in an EV or ICE (internal combustion engine) vehicle. In the UK the cost for driving a car costs on average £1,000 more per year than in the USA and Australia, £1,825 more than Japan and around £2,000 more than China. A lot of this cost is the price of fuel. For an average driver doing around 10,000 miles per year, they will be spending around £1,500 per year of fuel. Please contact us to share your experiences and tell us if you have saved money by switching to an electric vehicle. If you are a website owner, you can implement this calculator tool into your website by using the following HTML code for FREE.